These board shorts are perfect for beach day! 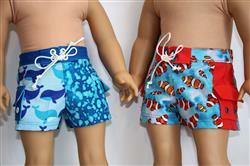 Two lengths include long and short for both boy and girl dolls. Like real life board shorts, they have no elastic and ride just below the waist. This PDF pattern contains 2 sizes that would fit both newer (skinnier) and older American Girl® Dolls. Choose between single solid color or color block shorts. Take a cue from real life board shorts and mix fabric prints. Choose a solid fabric for one leg and a print for the other leg. Add piping to the color block for detail. Pair them up with a midriff summer top or your doll's favorite swimsuit. Shorts include pocket and waist tab with polycord details for a more authentic look. This is a great pattern with easy to follow steps. I also find the photos very helpful. The final product looks authentic and fits well. I used the slimmer fit. I also used some people sized board shorts for my fabric as I couldn't find any I liked at my fabric store. Thank you for a great pattern. The boy dolls love it. I enjoyed sewing this pattern very much. The possibilities are endless actually. Unless you have the exact waist measurement it is wise to enclose some elastic in the back waist so that the shorts will fit correctly. That is my only suggestion. The rest is just fun with good directions and well done pattern pieces. Another winner!! Nice styling, I did add elastic to back.